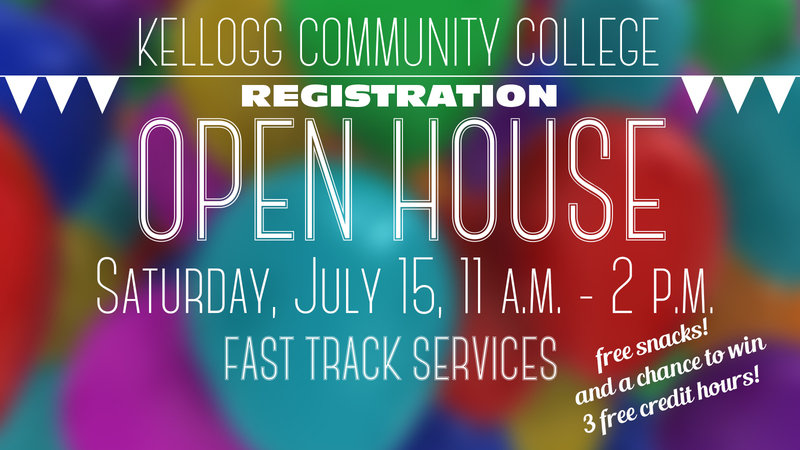 Current and future Kellogg Community College students, including Legacy Scholars students, can complete the bulk of the enrollment processes they need to start classes at KCC this fall in one afternoon during the College’s Registration Open House in July. KCC’s annual Registration Open House will be held from 11 a.m. to 2 p.m. Saturday, July 15, on the College’s campus at 450 North Ave., Battle Creek. The event will offer students and prospective students everything they need to be prepared to start classes this fall, including financial aid assistance, placement testing, academic advising and onsite registration. The Open House will also include free snacks, prize giveaways and information about KCC degrees and certificates. Attendees will even have an opportunity to enter a drawing for a chance to win three free credit hours at KCC. Additionally, the first 50 guests will receive a free KCC T-shirt. For more information, contact KCC’s Admissions office at adm@kellogg.edu or 269-965-4153. The first classes of KCC’s fall semester begin Thursday, Aug. 31. Student registration information, including links to registration instructions, policies, tuition and fees and other information, is available online at www.kellogg.edu/registration.